Why does the lawn need to be power raked in the spring? See the yellow thatch that remains in the base of the grass. This reduces the ability of new grass to grow thick and can promote disease. Picture was taken In late July! As our climate dictates a winter season, grass goes into "hibernation" or a dormant state. The sub zero temperatures kills all prior seasons grass blades and the snow accumulation packs them down against the lawns base. In the spring, once the snow has melted, we are left with a thick collection of these dead compressed blades of grass. This thick layer of organic material is known as thatch. The now warmer weather begins to rejuvenate the lawn and new grass shoots try to reach the sun but have to struggle through the compact thatch.This thatch acts somewhat like a sponge that absorbs any moister, inhibiting water reaching the roots. the water usually evaporates before it can reach the roots. Another fact is as the thatch is holding all this water it will begin to rot which is never a good thing. If the thatch is not removed new growth will have difficulty growing through it. Your lawn wont look as lush as it could as it will have a brown tinge from thatch under a few grass blades that managed to penetrate the thatch. Thatch also impedes fertilizer and oxygen from reaching the roots. We recommend you power rake your lawn every spring. The equipment used acts like a comb. Steel tines rotate at high RPM's and lifts up the dry thatch either expelling it into a bag or our a shoot. It takes experience to operate this machine properly. If the tines are set to low you can do major damage to the lawns root system which can take the lawn months to recover from. Why does the lawn need to be aerated? For optimal lawn thickness the soil can't be hard. Hard soil develops over time naturally by water, or by being walked on. Core aerating removes plugs allowing the soil to expand into these holes with root growth. This loosens up the soil so roots can move easily through it. Softer soil has better water absorption capabilities so you have less runoff and can use less water! saving you money and helping the environment. Core aeration also allows fertilizer to penetrate the roots better which gets better performance out of your fertilizer. Cores are good indicator of the lawn's health. GreenEdge lawn care analyzes these cores and makes recommendations to our clients to ensure optimal looking lawn.The cores provide samples to show how thick the lawns root base is and thatch accumulation. GreenEdge lawn care recommends to leave the plugs as they will break down and return the valuable soil to the lawns base. If you remove these plugs you should have the lawn top dressed. Stimulate the soil borne microbes, who's activity is important in creating healthy soil for optimal lawn growth. Founded in Calgary, Alberta, Canada in 1997.GreenEdge lawn care is a full service lawn care, landscaping, and snow removal company. Our mission is to provide professional, reliable and courteous service to valued residential and commercial clients. In the spring we offer power raking (dethatching), core aeration, fertilizing, and spring cuts. For the growing season we offer lawn maintenance for residential and comercial properties in three avalible scheduling methods; weekly, bi-weekly and ten days. We also offer snow removal services and Landscape design. We provide contracting for patio brickwork, sod, trees and shrubs, flower beds, fences and decks, custom concrete work, and retaining walls. Greenedge lawn care is commited to providing all clients with the highest standard of quality, Reliability, and after project consultation. There is no project too large or small for our specialists. Contact us with your inquiries today! The most critical part of lawn care is having a sharp blade! As we continue to strive to provide the highest quality of lawn care possible, we developed an innovative technology to sharpen lawn mower blades. This innovative tool allows our lawn mowers to have a sharp blade all the time, which has given us an edge on our competition. A blunt lawn mower blade tears through the grass blade instead of cutting it. Up close this excessive damage turns the green grass blade tips yellow. The grass tips are frayed having a look similar to torn fabric. From a distance the whole lawn has a brownish-tinge to it and can appear uneven. 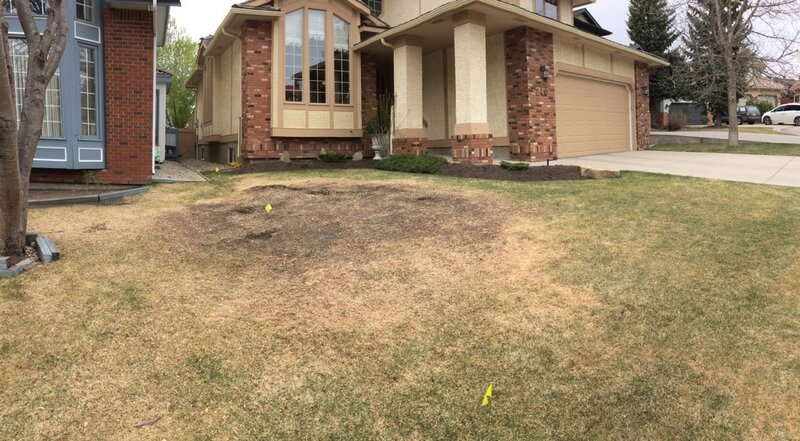 This damage to the lawn can increase the risk of disease as the increased surface is increased for pathogens to enter the grass (See tips section for more info). On top of having a sharp blade there are other variables that can affect your lawn. During the summer season in Calgary it is not unknown to have a few weeks of dry +25 degree weather. Under these conditions your lawn may appear to die but it has just gone into a dormant state as the heat stress is inhibiting lawn growth. To combat this Greenedge will cut the lawn up to 1.5 inches higher then during regular maintenance and will option to leave lawn clippings, a.k.a, mulch on the grass. The reason for this is to protect the roots from the suns damaging rays. and by coving the roots with shade from taller grass blades or the shade of mulch, the lawn has a better chance of not turning yellow. The aforementioned techniques also help in preventing water loss. To further ensure our clients the best looking lawn possible we only remove the top 1/3 of the grass blade allowing the grass to remain healthy and lush and prevent the onset of any grass diseases. Is there any other way of getting rid of dandelions than using herbicide? 1) ensure the lawn has a good soil base and correct PH level. 2) adequate fertilizer and water applied to the lawn. 3)over seeding the lawn when necessary using a parks mix. 4) power raking the lawn yearly and Aerating as necessary. This program builds up the lawns root base so thick that weeds actually have a hard time growing in it. 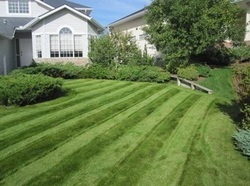 This can take a few years to achieve but is well worth the effort to have a lush green lawn while avoiding herbicides. thanks for the five years of professional and reliable service GreenEdge has provided. I Look forward to the continued high level of service you have shown in the past both with lawn care and Spring cleanup. Keep up the good work. Thank you. P.S. the Fertilizer is phenominal ! " late yesterday that the house had sold. for the exemplary work GreenEdge lawn care has provided us. I think the way your company maintained our 2-acre property over these past few months contributed to the fast sale of the house and I would highly recommend you to anyone looking for professional quality lawn-care. lawncare this last summer. We hope to see you again in 2012. 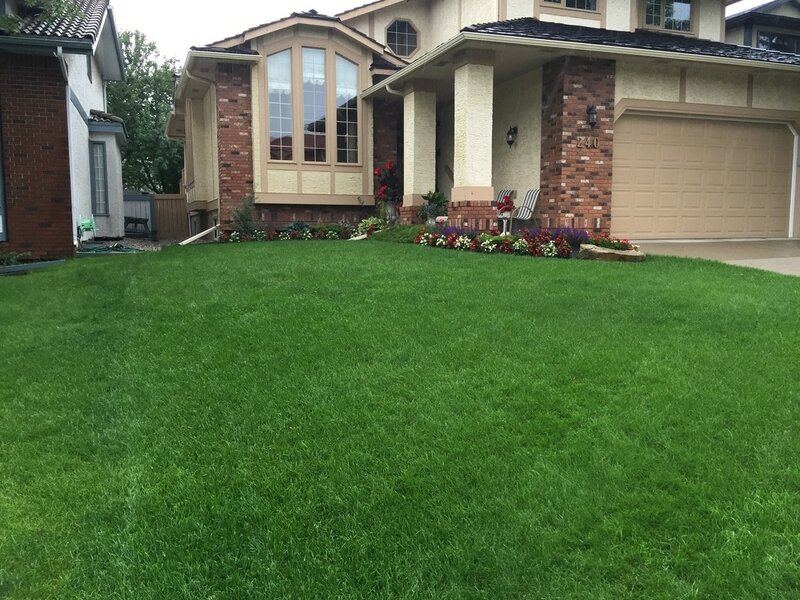 GreenEdge lawn care provides lawn care to primarily N.W. Calgary residents. 121 Scenic Park Place N.W.